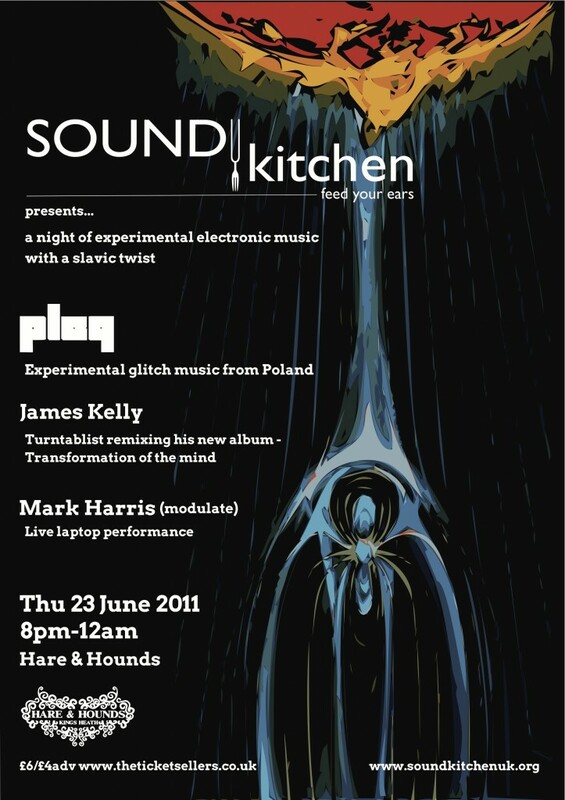 The next SOUNDkitchen event is on Thursday 23rd June 2011 at Hare and Hounds. We are very excitied about our headline act Pleq who is joining us all the way from Poland. Pleq is the solo project of Bartosz Dziadosz, an experimental musician who combines elements of drone, down tempo, glitch and modern classical. He creates his work by fusing together independently synthesized sounds, often incorporating violin, the unexpectedly melancholic sound of a piano and sometimes female vocals. Also on the bill is Birningham based Mark Harris, no stranger to SOUNDkitchen having performed at our opening gig with modulate and one of the contributors to our first collaborative project STONEsoup. He will be performing a solo laptop set. Fianlly we are welcoming Leicester based turntablist and composer James Kelly to perform a live vinyl remix of his studio album Transformation of the Mind with live vocals from Ola Szmidt. Check out the links and SOUNDkitchen website for artist bios and soundcloud audio samples.